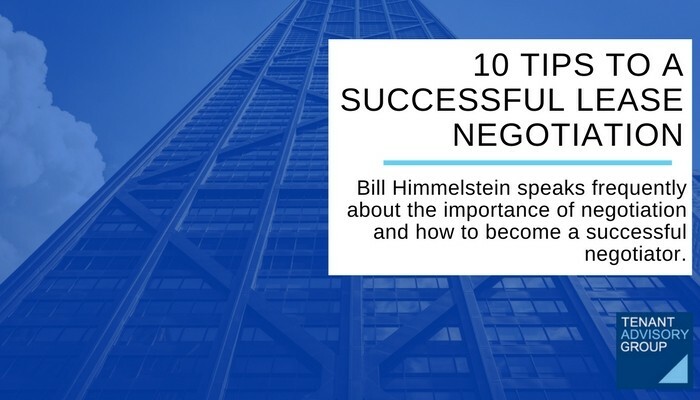 Bill Himmelstein speaks frequently about the importance of negotiation and how to become a successful negotiator. His last seminar honed in on the importance of negotiation when securing your lease. Below are his 10 Tips to a Successful Lease Negotiation. 1. Business terms– Double check that the business terms agreed to in Letter of Intent are the same as in the lease document. 2. Sublease clause– reasonable consent should not be withheld by landlord. Landlord will ask for 100% of profits. A 50/50 split is fair. Seek to minimize notice to landlord and response time from landlord. Consent shall not be necessary for purchase, sale, or merger. 3. Hold-over clause– landlord will ask for 200% of rent, however, 150% is fair and market. 4. Renewal Clause– landlord may ask for automatic renewal if no notice. This is not acceptable. It’s nice to have rights to space. Negotiate rate when possible as it will still be negotiable at that time. 5. Work letter– this should be studied closely to make sure everything matches up to what LL said he was going to deliver. If there is an allowance, base building items should be taken care of by landlord. If landlord constructing, make sure liable if no deliver on time. 6. Right to Terminate– this can be a great source of leverage to restructure lease regardless of how market has changed since execution. 7. Surrender of Premises– space shall be returned in broom clean condition, nothing more. Landlord may ask for space to be returned to white box. That is unacceptable. 8. Taxes & Operating Expenses– it is important to make sure capital improvements are not passed along to tenants through operating expenses. If gross lease, should be a Base Year. 9. Insurance requirement– have a qualified insurance broker review coverage requirements. 10. Damage or Destruction by Casualty– seek to minimize time in which lease can be terminated, and maximize the remedies available to the tenant. When negotiating the details of a lease it’s important to be familiar with even the most infinitesimal details. An experienced real estate attorney will be able to facilitate this by reviewing the legal terms of the lease. Also, it can be advantageous to have an experienced commercial real estate broker negotiate the business terms of the lease. Both are paid by the landlord through a fee that already exists. This will save you time, money, and hassle!